Ever searching for an SLS-free shampoo which works well with my oily hair, I nearly did an excited dance when I spotted these Kind Natured products on the shelf in my local Boots a few weeks back; it's not a brand I'd heard of previously but, with my beloved Naked having been discontinued, I'd thrown a bottle each of shampoo and conditioner in my basket within seconds! I tend to choose Volumising shampoos when I'm first trying out a range as I find these tend to work best for my oily hair, but as I swim a lot and have quite dry ends I usually choose a more hydrating conditioner - in this case, from the Nourishing range. I really like the packaging, it's simple and pretty and does exactly what it needs to do. These have been my gym hair products and I'm pleased to say there's been no nasty leaks in my bag which is always good! Both the shampoo bottle and the conditioner tube are sturdy yet easy to use. 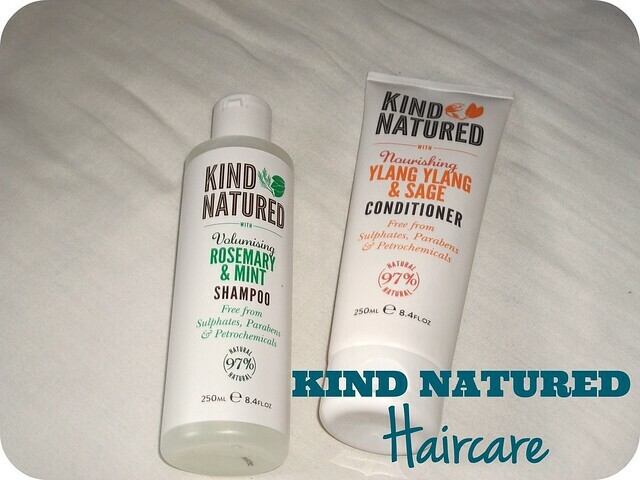 "At Kind Natured, we believe in keeping it natural. Delight your hair with our carefully selected plant and natural extracts, and fabulous fragrances to leave your hair looking and feeling amazing. 97% Natural and free from Sulphates, Parabens and Petrochemicals, we aim to bring you beautiful hair, just as nature intended!" "We have gently combined a zesty blend of Rosemary and Mint with volume-boosting ingredients to bring you an uplifting Volumising shampoo, perfect for invigorating your hair as well as your mind. With added Ginseng and Ginger, this shampoo leaves locks looking fuller, thicker and with added oomph." I was a initially a bit concerned that the combination of Mint and Rosemary in the Volumising Shampoo might leave me smelling like a roast lamb dinner... Thankfully, the scent is much more subtle than that, and really just smelt fresh and pleasant, which was a relief! I've found that the shampoo is a little difficult to work through my hair, taking a little bit more effort than I'm used to, but it's not impossible by any means. It rinses out easily enough and after I've shampooed twice (as I always do, more through habit I think than anything else!) my hair does feel clean without being stripped. "We have delicately blended a fusion of hydrating and moisturising ingredients into this Nourishing Conditioner to help condition and restore hair. Ylang Ylang and Rose deeply moisturise dry hair, whilst vitamin-rich Passion Flower and Sage help to stimulate the scalp to maintain strong, healthy hair. Tresses are left feeling deeply nourished, sumptuously silky and soft." I wouldn't use this on my roots as the directions suggest, but I apply generously to the mid-lengths to ends of my hair and give it a minute or so to soak before rinsing. My hair is left feeling soft and smooth, and tangles comb out easily. There isn't much of a scent to the conditioner which is just fine with me; a luxurious scent in my haircare is more of a bonus than a must-have for me. 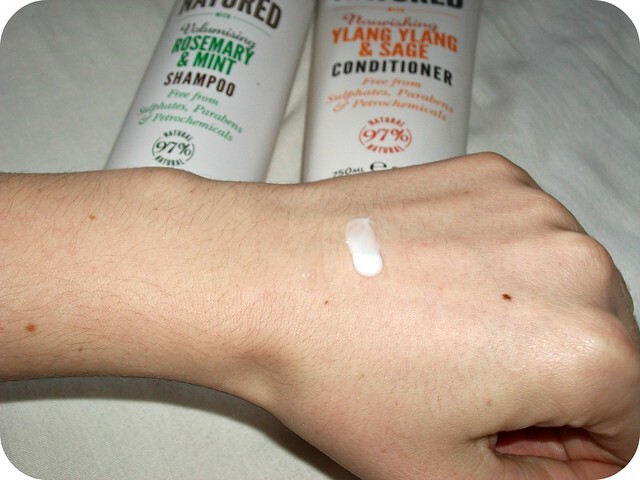 Overall I've been impressed with the Kind Natured hair products I've tried, and I'd pick them up again; the Volumising Shampoo seems to work well with my oily scalp, whilst the Nourishing Conditioner hydrates my dry ends and keeps my hair feeling soft and smooth. Kind Natured also have a range of Bath Soaks and Body Washes which I'm keen to try - I love the sound of the Coconut & Passionflower Body Wash, £4.99 for 250ml. I think the whole range is really reasonably priced and it's certainly one I'd recommend if you prefer to use SLS-free hair products; as well as the Volumising and Nourishing lines, there's also a Colour Care duo, so there should be something to suit your hair needs! Kind Natured Volumising Rosemary & Mint Shampoo and Nourishing Ylang Ylang & Sage Conditioner are priced at £4.99 each for 250ml of product, available from Boots. 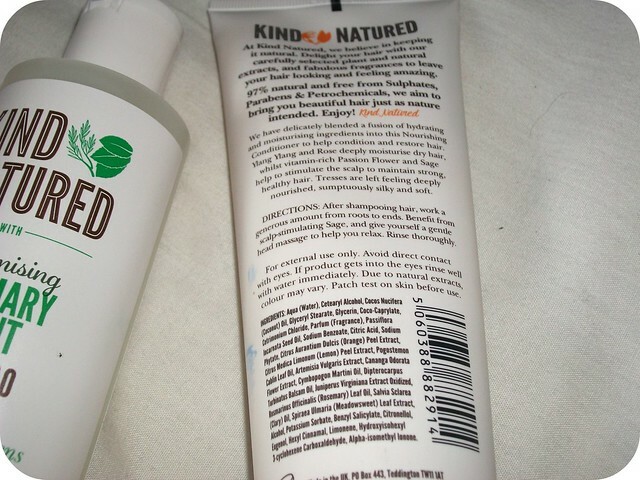 Have you heard of Kind Natured? Have you tried any of their products? Have you any budget-friendly SLS-free haircare favourites to recommend? I feel like I immediately need these - literally two of my favourite scent combinations, I have a rosemary and mint handwash in the bathroom at the moment that I can't stop sniffing! 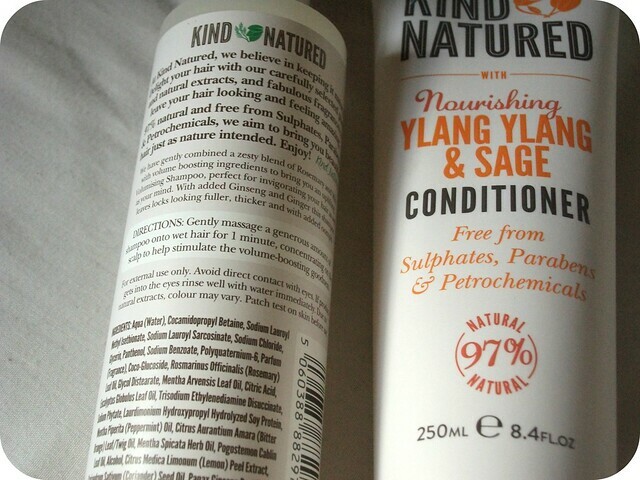 Shame the conditioner isn't as heavily scented, but I'm definitely gonna try them out! I love that these have mostly natural ingredients, and the mint/rosemary scent sounds so refreshing! OMG I NEED THIS for sure. That combo sounds so fresh and invigorating for sure!!! wow, these sounds absolutely wonderful! Hi does anyone know if this product is tested on animals,I have asked in boots and contacted there customer service.No one knows,have been told to contact the product manufacturers. I was thinking the same so got in touch with Boots who replied saying that "After looking into this further for you, I can confirm that the 'Kind Natured' brand is not tested on animals." It's always difficult to know whether to trust this kind of information, though! i hope this helps. I have just 'discovered' these in my local boots. I was looking for a more readily available natural shampoo. This fits the bill. Im glad to hear that its not tested on animals but does anyone know if the fragrances are natural? The ingredients just says 'fragrance' and ive noticed they smell a little un-natural ( I bought the children's range too and the Apple shampoo is VERY full on.). I have been using these two products for a few months. I love this product and want to buy more. My problem, I live in Canada and I purchased them at a Winners store that do not bring them in on a regular basis. I need to find a supplier that will ship to Canada! !